As an article from earlier this year in Fleet Equipment Magazine makes clear, shipping costs for refrigerated goods can be greatly reduced with a good fleet temperature monitoring system. Of course, putting a monitoring system in place requires an investment from the fleet manager who must decide if the anticipated savings will be worth the investment. However, now with the release of the FDA’s Food Safety Modernization Act (FSMA), temperature monitoring and reporting is a must. The potential gains range from the obvious to the more subtle. The most obvious cost savings come from eliminating spoilage. Real-time temperature monitoring allows central oversight of truck temperatures and can allow easy verification that proper temperatures were maintained throughout a journey. These records can also be used to defend against claims that good were damaged by heat in transit. This is important for every product, including fresh produce and frozen food, but it is also incredibly important for high-value assets like pharmaceuticals. A good fleet temperature monitoring system also allows fleet managers to better manage their people, especially when combined with sensors that monitor things like mileage, engine performance, location, and movement. An integrated monitoring system allows fleet managers to know if their vehicles suddenly begin to burn a lot more fuel than normal. That can be a sign that fuel is being lost because of a maintenance problem or even because of theft on the part of a driver. A monitoring system can track duty time of drivers and anticipate upcoming maintenance needs based on mileage or engine hours. Perhaps just as importantly, real-time monitoring can eliminate countless hours of running around the yard locating trucks and checking their status one at a time. Because trucks are generally only making money when they are hauling a load, good data is necessary for a large fleet to maximize its utilization. 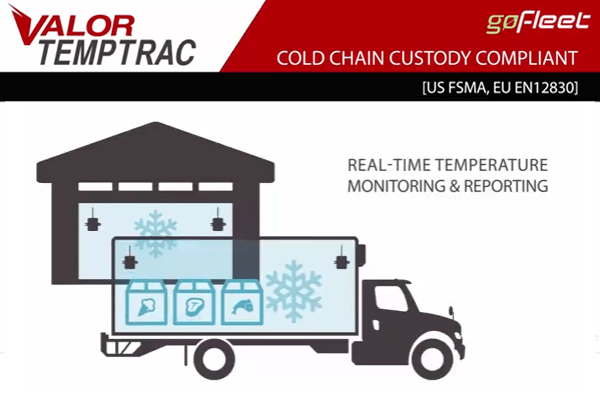 Our fleet temperature monitoring system is an industry leader in temperature monitoring systems and is cold chain custody compliant. It provides real-time temperature monitoring with a check every four seconds in up to four different zones in each truck. No manual inspections are required, and fleet managers can get an automatic alert when temperatures reach a critical level. These continuous temperature checks are also recorded to assure accountability and help maximize the usage of a fleet, and remain in compliance with the FSMA. Our system is fully integrated with other add-ons and add-ins, including our GPS vehicle tracking device that collects data from a number of available sensors on board a vehicle and then provides that information to a fleet manager’s central monitoring system. Our wireless temperature monitoring system relies on sensors from Valor, a leading research and design institute known for precise and reliable sensors. Valor designs and manufactures its own sensors; the in-house manufacturing component allows Valor to constantly innovate and keep costs down. Valor has partnered with Geotab, the manufacturer of our GPS-enabled tracking devices. The devices collect data from the vehicle and then our software collects presents this data to fleet managers in a user-friendly and stress-free interface.